An intense surface low dug into the Southwest yesterday, bringing high winds and dust across much of Southern California, and Arizona. At 05:00 pm MST yesterday (above) the low was centered somewhere near Bullhead City, Arizona. This morning the surface cyclone is centered along the Arizona/Utah border, west of the Four Corners. Winds yesterday gusted in 70 to 80 mph range over parts of the Mojave Desert, before shifting eastward across Arizona during the night. The airport recorded 45 mph around midnight. 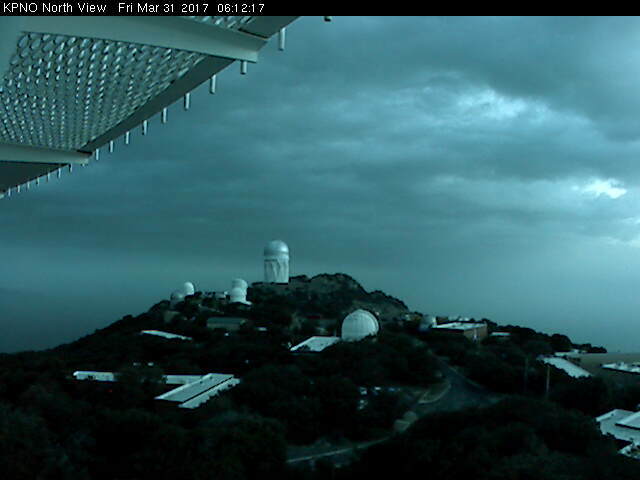 View a bit after 06:00 am this morning to the north of Kitt Peak (above) shows dust extending upward to near the bases of the middle cloud layer. There were light sprinkles across the metro area and composite radar below is from just before 07:00 am. 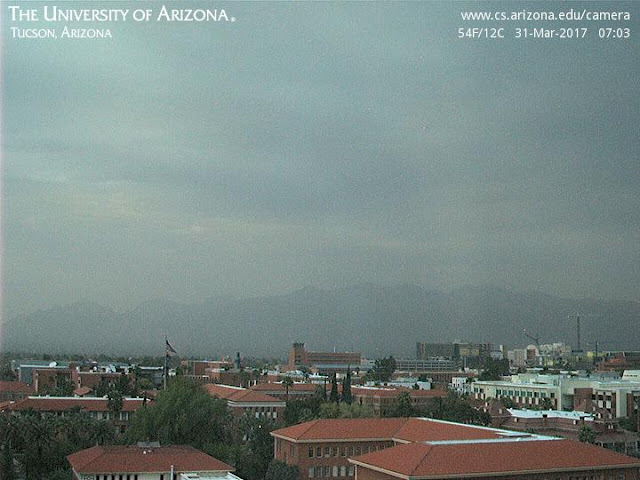 View at bottom from campus captures a mix of clouds, dust, and light showers. Here at the house there were dirty sprinkles between 06:30 and 07:00 am. Wind gusts across Arizona were generally in 30 to 60 mph range. Some of the higher gusts I noted when I scanned the observations this morning include: 80+ mph at the 4-M telescope on Kitt Peak; 72 mph at the Hachita Valley RAWS in southwest corner of New Mexico; Flagstaff 66 mph; Guthrie RAWS 65 mph; and 61 mph at Ft. Huachuca. Guess I was distracted by Al running around at University of Oklahoma yesterday. Turns out that a couple of ensemble member forecasts got the very low POPs event of early this morning. Regional radar above is from 03:00 am MST. Airport and DM had thunderstorms in addition to the light showers. TUS reported 0.21" and DM had 0.11", while we had 0.06" here at house. The 06 UTC WRF-GFS caught up with what was happening and its forecast for 04:00 am is below - but of course by the time that forecast ran, the showers were moving into the metro area. The atmosphere out-performed the models this time around. Portion of ALERT network shown above is 6-hour precipitation ending at 06:00 am this morning - rainfall mostly centered over core metro area, with amounts generally less than a tenth of an inch. The showers mainly cleaned out most of the dust and pollen, so that it was a beautiful early morning with clean and sparkling skies - below. 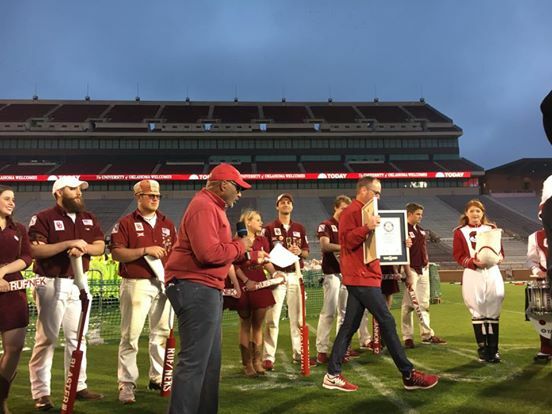 Al Roker did his morning US forecast from the University of Oklahoma football stadium. He's preparing above with band members, and then does a weather-run-around with the band providing the background graphics. Guess some could argue that this is a better use of the stadium than are the University's professional football games. Locally, best chances rest of month are for some windy afternoons. Below is 06 UTC WRF-GFS forecast of total precipitation through 11:00 am MST on March 30th. However, a few ensemble members continue to forecast slight chances for some light showers before April arrives. Precipitation Here Before End Of Month? The forecast runs from 00 UTC last evening are holding out a slight bit of hope for some precipitation here before March comes to an end. The GEFS plumes are shown above, while the WRF-GFS forecast of total precipitation (below on the 5.4 km grid) goes out through 05:00 pm MST on the 31st. The big centers of action are northern California, Colorado, and the Southern Plains. Down here we're along the fringe of the active pattern and will have to watch how things evolve. Another event fizzles out with respect to precipitation - this has been the pattern for last three systems or so. Looks pretty good in model forecasts at longer time frames and then gets drier and drier in the shorter range forecasts. The 12 UTC WRF forecast from yesterday for entire "event" proved pretty good. Basically zero POPs observed across the metro area. Above graphic (from weathergraphics.com and Vaisala) shows CG flash density for past 48 hours. Considerable lightning west to north and one thunderstorm at north end of the Santa Rita Mountains. A station at Corona had 0.07" - pretty much the big event locally. Map below from MesoWest shows 24 hour precip reports of mostly zero in eastern Pima County. Two very slight sprinkles this morning here, but mostly afternoon winds of 30 to 40 mph and some blowing dust. There will be a couple of more systems before the month ends but remains to be seen whether one of them will actually bring a rain event. The cooler temperatures are are a nice change. As was the case with the last few systems, the forecast models have trended drier as this event neared in time. The plumes from the SREF system above are from the SPC and are for the 09 UTC run valid for TUS. The mean (black) is only 0.04" (vertical scale shown in increments of 0.025" - thus the second highest airport amount shown by green line is just 0.10"). For unknown reasons the MIMIC PW and the GEFS plumes have not been available since 12 UTC Monday morning this week. The forecast below shows total precipitation forecast by the WRF-GFS at Atmo for period from 06 UTC last night through 11:00 pm MST tomorrow night. Almost a total miss for southern Arizona in the current model forecast. The forecast soundings still indicate a chance for shallow showers with the cold front, centered around 02:00 am early tomorrow, indicating a bit of hope remaining. Bottom image shows a bit of early morning color on our placita. 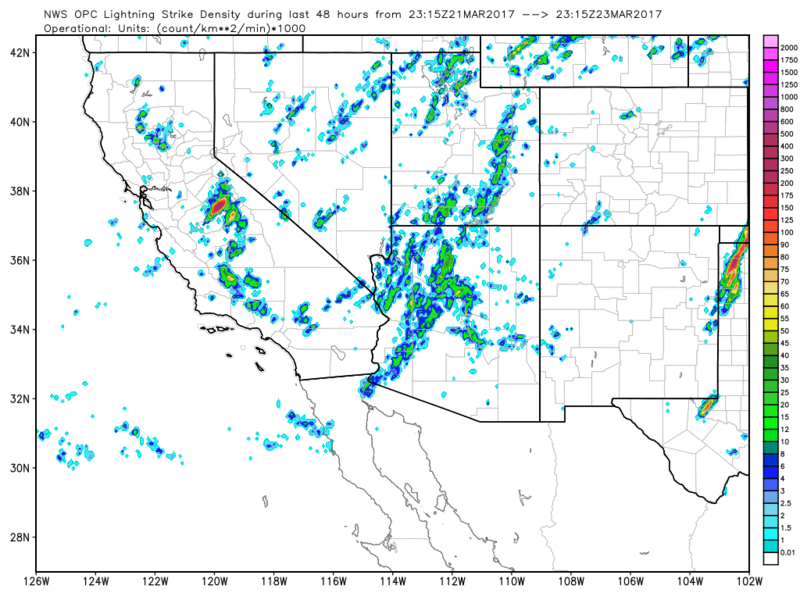 Models forecast the possiblity of a moisture-starved event on Wednesday night as a rapidly weakening AR affects southern Arizona. The 00 UTC 20 March QPF plumes for TUS are shown above (from the GEFS). The operational GFS (blue) was one of the wettest forecasts at 00 UTC. The GEFS forecasts 100 % POPs for the airport Wednesday night into Thursday morning - current NWS forecast bit more conservative at 40%. Remember that the grid point forecasts used to extrapolate the GEFS to TUS are a fair ways off and all at higher elevations than the airport. For comparison the plumes from about the same lead time for the February 28th "event" are shown down at the bottom. The 00 UTC WRF-GFS forecast from Atmo for total precipitation through 05:00 pm MST on Thursday (above) avoids the airport. However, the forecast sounding for TUS below is valid at 02:00 am on Thursday and shows some threat of showers or thunder during the night. The 06 UTC runs have become somewhat drier than were the 00 UTC forecasts. So another iffy situation for us to watch. Another day here with high temperatures above 90 F - enough is enough. 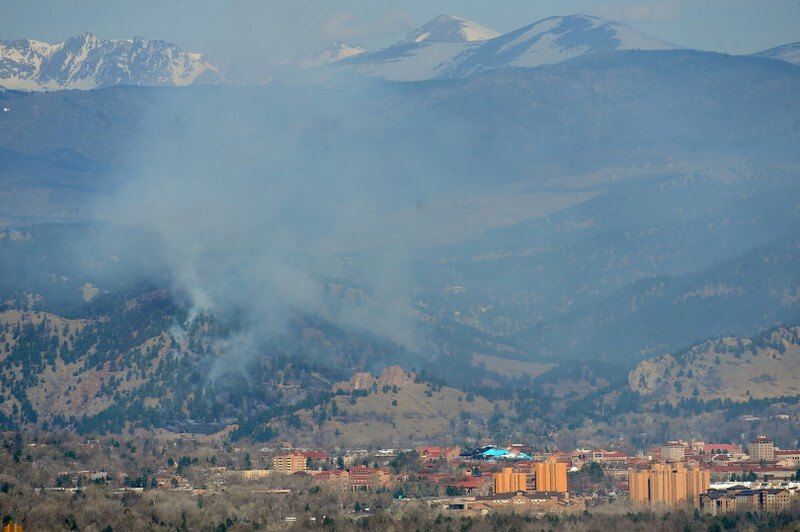 Wildfire burning this afternoon in Sunshine Canyon just to west of Boulder. 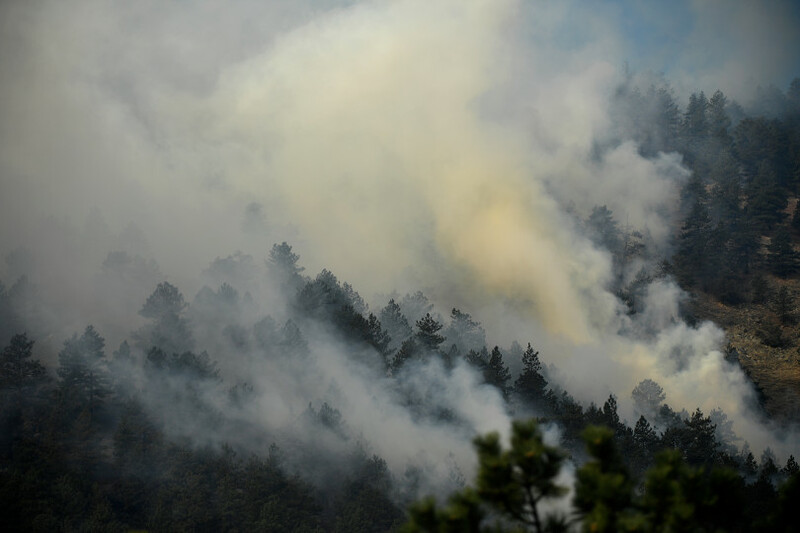 More than a 1,000 homes have been evacuated today. Much snow in high country but Plains and Foothills very dry with gusty winds. Today's high temperature reached above 90 F again - hitting 92 F. This morning the NWS posted the graphic below about the number of temperature records observed so far this March. 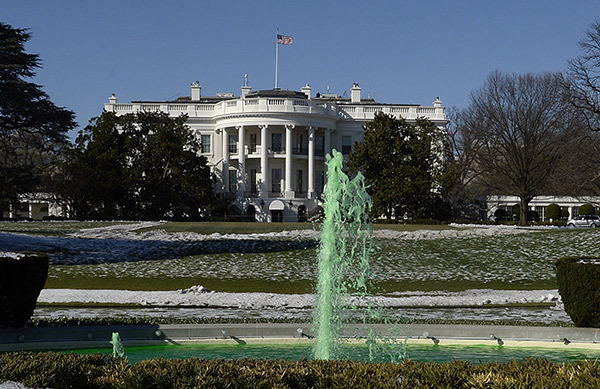 Trump administration - we don't want or need the EPA - perhaps this is the future of D.C. water? 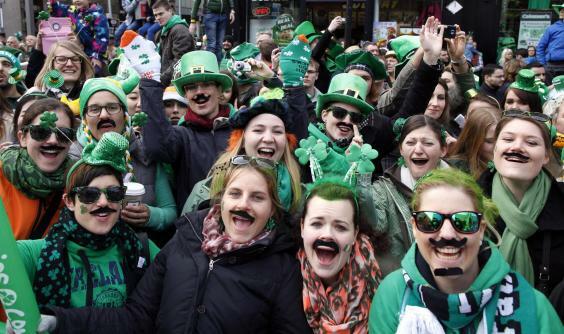 More smiles across the Pond in Dublin today than in D.C. Weather Returns Middle Of Next Week? Has been very mundane weather, dominated by hot and dry, since February 19th with only rain being 0.02" here on the 28th. The current forecast from NWS this morning indicates high temperatures in middle 90s F for Saturday and Sunday, but by Wednesday next week the forecast is for chances of showers and thunderstorms, with 30% PoPs for at least 0.01" of rain at the airport. Have taken a far-ahead look at the 00 UTC forecast run of the WRF-GFS from Atmo last evening. The 500 mb forecast above is valid at 11:00 am MST next Wednesday, March 22nd. 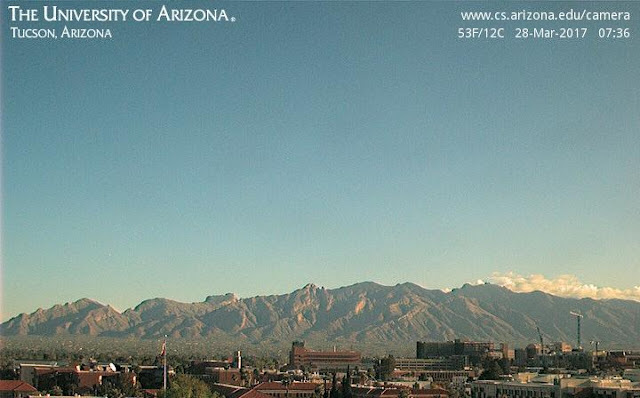 A cold, negatively-tilted short-wave trough is forecast to be sweeping across Arizona at that time. The forecast sounding for Tucson at 10:00 am that morning (below) is quite impressive wrt to the current very hot and dry soundings. There is CAPE and 20 mm of PW in the forecast skewT as another weakening AR sweeps by southern Arizona. The model's forecast of composite radar echoes valid at 11:00 am that morning (bottom) is also very impressive. Of course, this is VERY far ahead and it will be interesting to see if the models prove more accurate than they were for the "event" of February 28th. 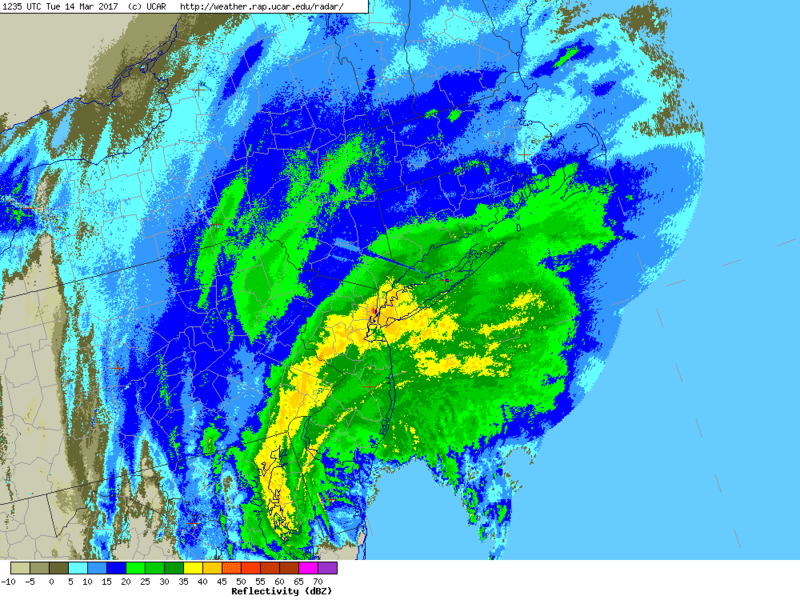 Dangerous storm centered along the coast south of NYC with large precipitation shield (rain, sleet, and snow) covering New England. Impacts will dominate news today. Above shows regional radar at 1240 UTC and below shows Columbus Circle (south end of Central Park) about 5 hours ago. The flight misery map is at bottom. 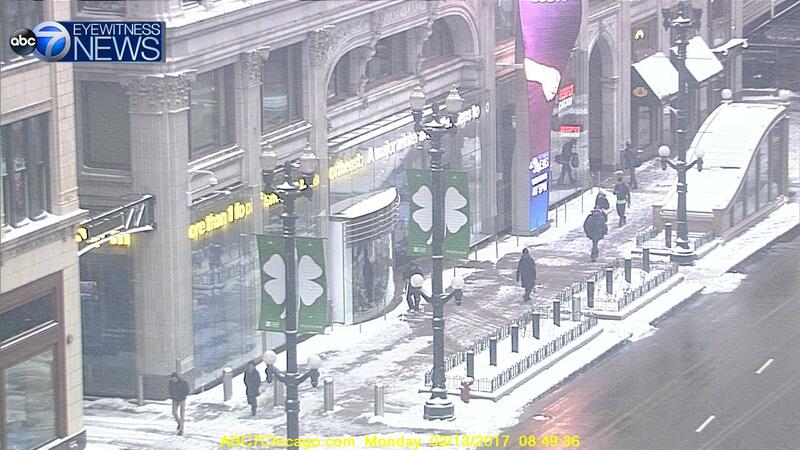 Above is view of State Street, downtown Chicago, this morning, and below is surface plot for Midwest a bit before 07:00 am MST. The surface low is centered a bit north of Columbia, Missouri, with a central pressure of only about 1016 mb. However, surface pressures are very high to the north and east of the low, providing strong gradients. The low is expected to deepen and impact the entire northeast of the country tonight and tomorrow - from DC to Maine. This storm has already been the main weather news over the weekend. Air travel has been delayed, mostly in Chicago area (Misery Map above for 06:00 am), and current delays/cancellations shown below. Situation will be very much worse by tomorrow morning. We were at Santa Rita Abbey Friday late and yesterday. Very warm and dry and generally brown out in the Sonoita area. There were a few wind gusts in 20 to 30 mph range from the west yesterday afternoon, after cirrus-filled skies early. Above is sunrise view and below is Mt. Wrightson in the early morning light. At bottom is a pear tree in full blossom during early March. Very quiet, Chamber of Commerce weather continues in our area. Will post a few hawk photos this morning. Above is a Coopers Hawk posing atop a fence post Wednesday morning. This one has been around our neighborhood for a number of years and is banded on both legs. The band on left leg is visible above. Redtail was preening and sunning on power pole this morning; one of about four that nest right along Rillito at end of Cactus. Caught a bigger bird in overflight just below and, then the the Redtail heading off to the northwest.